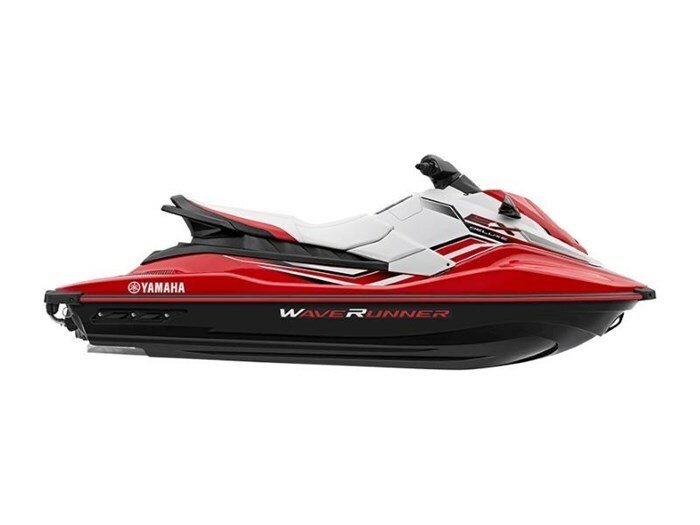 2019 Yamaha EX Deluxe CONQUER WATER Welcome to Generation EX® - the line of entry-level WaveRunners that delivers endless fun on the water. The EX Deluxe is value-packed, featuring Yamaha's award-winning TR-1 engine and innovative RiDE technology. RIDE TECHNOLOGY The world's first dual handlebar throttle control system is easy and intuitive. Pull the right lever to go forward, and the left lever for reverse. Pull them both, or in any combination, and the system reacts with precise control. Benefits include better handling, smooth deceleration and more control while turning. HYDRO-TURF® Lightweight, slip-resistant Hydro-Turf® mats provide superior traction on the extended swim platform and footwells. REBOARDING STEP Reboarding made easier with a step that tucks away easily when not in use., Features may include: POWERPLANT TR-1 four-stroke marine engine. The EX is powered by Yamaha's award-winning TR-1 three-cylinder marine engine that is 40 percent smaller in size, 20 percent lighter in weight and provides better fuel economy than Yamaha's previous four-cylinder Yamaha MR-1 engine. Electronic Fuel Injection (EFI): Delivers a smooth, high power output with low fuel consumption and low exhaust emissions. JET PUMP PROPULSION SYSTEM Ride (Reverse with Intuitive Deceleration Electronics) — The world's first dual handlebar throttle control system is easy and intuitive. Pull the right lever and go forward. Pull them both, or in any combination, and the system reacts with precise control. Benefits include better handling, smooth deceleration and more control while turning. Cooling Water Intake Filter: Filters out harmful debris that could cause blockage of important cooling water passages. ULTRA-LIGHTWEIGHT, HIGH STRENGTH HULL AND DECK The EX hull is designed to be light and strong. Under the waterline is an all-new hull design that is manufactured to precise tolerances. This lightweight SMC hull delivers excellent stability for one, two or three-up riding and towing, and precise responsiveness and predictability for thrilling one-up riding. Progressive, V-Hull with Integrated Bow Spray Guard: Provides excellent maneuverability, handling and comfort.